South Africa is probing a potential catastrophe lurking beneath its richest city - illegal gold miners are digging and blasting 30 centimeters from gas pipelines beneath some of Johannesburg’s most vital infrastructure, raising the risk of explosions. The government has been jolted into action after the Sunday Times newspaper reported on the activity that could create an inferno. Some of the illegal miners are digging right below the 94 000-person capacity FNB Stadium, while others are active beneath major motorways such as the M1 and M2, the newspaper reported, citing Conel Mackay, the head of Johannesburg’s infrastructure-protection unit. Johannesburg lies in the middle of the Witwatersrand basin, the source of a third of all gold that’s been produced in the world. Most of its old mine workings are shallow with illegal mining being conducted tens of meters from the surface. What makes the situation even more hazardous is that illegal operators have very little understanding of underground rock formations, said Raymond Durrheim, a geoscience professor at the University of the Witwatersrand. 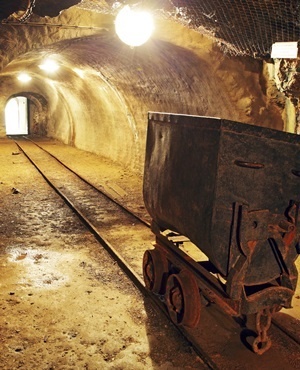 "The mines around Johannesburg are quite shallow and the illegal miners are not taking any precautions so there is risk of collapse and affecting the surface," Durrheim said. "The activities in the area pose a hazard to people." The Department of Mineral Resources asked the Council for Geoscience to assess if there is any long-term damage to critical infrastructure, it said in a statement. A breach of the pipelines would result in a "disaster, with major infrastructure damage," according to Transnet. The state-owned ports and pipeline operator isn’t aware how close illegal miners are to its infrastructure, the newspaper reported. The pipelines carry highly flammable gas that’s rich in methane, Sasol, which imports gas from Mozambique to South Africa, told the Sunday Times. Companies that abandoned the sites decades ago after commercial ore was depleted may have sealed some mine openings, but illegal operators are still able to access them and policing is difficult because of the wide area in which mining used to take place, Durrheim said. "These things could be dug open again, for the companies to have made something that’s absolutely impenetrable is difficult," he said.